"The one whose main goal is the financial profit, can never be successful." 1. How can i4wifi guarantee that you will always have the equipment you need for your network? How much time will they need for installation? What’s the warranty for the connection equipment? Does the price correspond to the equipment’s performance and design? How do they communicate with customers? Are they helpful? And then I would select the supplier who best meets these criteria. These areas are exactly what we focus on at i4wifi, and because we’re trusted by most internet providers and have received a positive rating from 98% of customers on the independent Heureka.cz comparison tool, we know we’re doing it right. 2. What’s i4wifi’s experience (and how do I know you understand this stuff)? i4wifi has been a wholesale distributor of wireless, metallic and optical connection equipment for more than 15 years (since 2003). Since 2006, we’ve been organising regular training events focusing on MikroTik RouterOS, Ubiquiti, GPON and other systems, and over the years we’ve trained over 7,000 IT specialists. To our customers, we provide technical support particularly in setting up MikroTik RouterOS. Our specialist Michal Štěpánek spends one week out of every month configuring systems at our customers. In all the 15 years, we’ve never encountered a request that we couldn’t handle. Every year, we serve about 8,000 customers from 40 countries. We dispatch 25,000 packages. Process 24,000 queries. Send 150 trucks all over Europe. Dispatch 50 planes carrying packages for our overseas customers. And drink 375 litres of coffee doing it (some of us four times a day). We have written a total of 70 articles. Published 30 technical answers. Responded to 24,000 technical questions. We know our customers’ everyday business, because we do selected installations ourselves. After 15 years of experience, we know we’re doing it right. Do you want proof? The owner of a company where we did an installation recently was so happy with it that he asked us to redo his home network as well. Now that’s appreciation! Only a supplier who understands their customer’s business can be truly useful. 3. How big is i4wifi (and how do I know you’ll be here tomorrow)? To make sure you know you’re dealing with a stable and strong supplier, i4wifi publishes its basic financial indicators every year. Annual distribution report of telecommunication products. We also have a beautiful and happy history full of important milestones. We provide customized solution for our global customers. 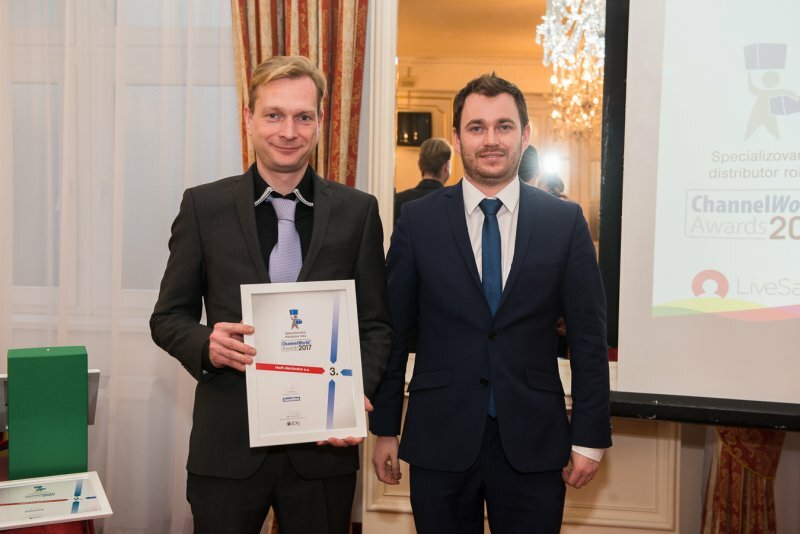 We are among the TOP 100 leading IT companies in Czech and obtain the CEKIA Stability Award evaluate the stability of company and awards grade by the financial and non-financial indexes. 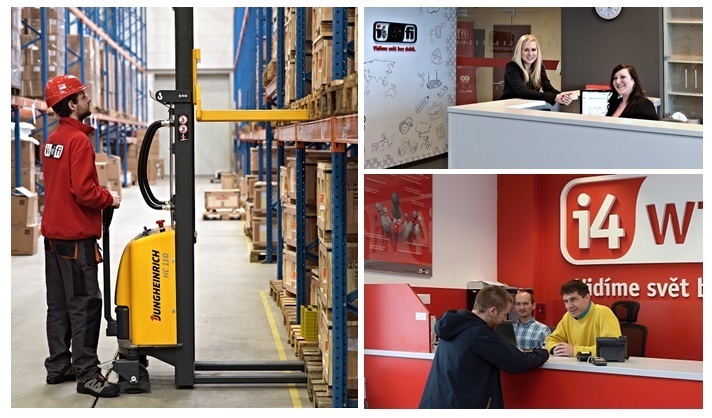 We were awarded by the high grade AAA means excellent stability which has only 2% of Czech companies. Our customers consider us the third best specialised distributor in the country and our main brand Ubiquiti has won first place among the best manufacturers of network products. 4. How many customers does i4wifi have? Every day, we respond to dozens of customer queries from all over Europe. And we receive hundreds of orders a day. And every day, we send our customers packages with the connection equipment that they need and that they install at their customers or use to connect to the Internet. 5. What are i4wifi’s warehouses, facilities and staff like? 6. Can I see the products that i4wifi supplies anywhere near me? Probably right at home if you look at your Wi-Fi router, or in any public area where you connect to a free hotspot. Even though we specialise in computer networks, we can also provide affordable solar panels. Both have one thing in common: you will usually find our products on the roof. 7. How does i4wifi handle its occasional mistakes, errors or complaints? Because we serve eight thousand customers a year and send some 25 thousand packages, unfortunately we do sometimes make a slip and pack in something extra. Or forget to pack something. Or mix something up. Thanks to our logistical system with fixed addresses and double-checking of dispatched items, our error rate is kept to a minimum. On average, we only make a mistake in 0.12% of all fulfilled orders. That’s not a bad figure, but we’re still just human and we may exceptionally make mistakes. If that happens, we will of course send you the missing goods immediately – at our own expense. 8. How is i4wifi contributing to the development of the wireless connectivity industry? We’re proud of the fact that we’re not just boxies movers, but innovating the entire industry. Every year, we organise 40 training events - MikroTik (MTCNA, MTCTCE, MTCWE, MTCINE, MTCRE, MTCNA UPDATE), Ubiquiti (UBWA, UEWA) or GPON networks training and continuously select and personally use products from new manufacturers. We share your customer feedback and your wishes with our current partners and sooner or later most of our requests are fulfilled. 9. How can I verify everything you’ve just said? 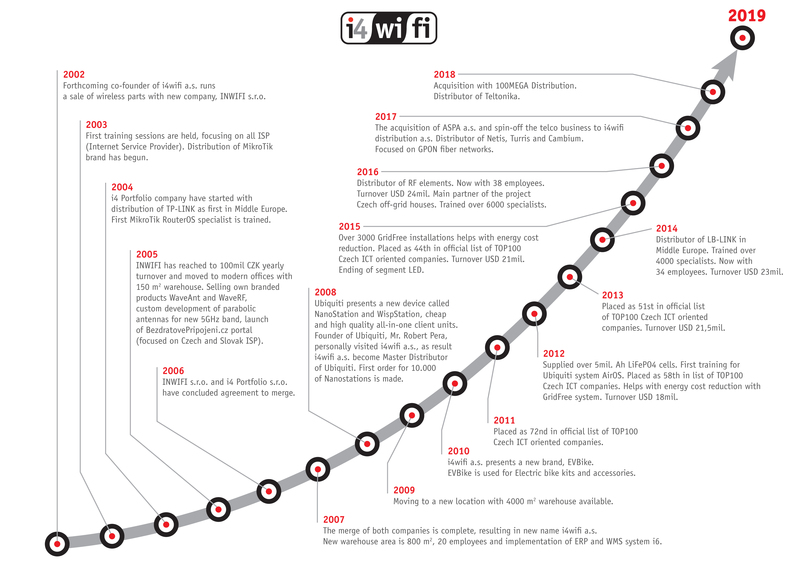 We hope that this information will give you a clear insight into how reliable i4wifi 100MEGA Distribution s.r.o. is as a partner, and we will be happy to prove it to you during your first order. We call you to co-operate with us. We trust in our capability to bring solutions to all of our customers, including you. Please contact us here or select what you need from the menu on the left.